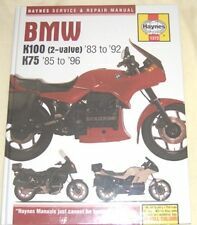 NEW Haynes Manual For BMW K75,K100 1983-1996 Manual Haynes BMW K75,K100 83-96. Whether you're a beginner or a pro, you can save big with Haynes! Wiring diagrams. Steering, suspension and final drive. Brakes, wheels and tires. Ignition and electrical systems. Fuel and exhaust. Cooling system. UK K75 740cc 87 - 96. USA K75 740cc 88 - 95. UK K100 987cc 83 - 90. USA K100 987cc 84 - 86. Since Haynes Publishing was founded in 1960, more than 150 million Haynes Manuals have sold throughout the world, more than half a million in the. It covers the R100RT, R100RS, R100CS, R100, R80 RT, R80 G/S, R80 ST, R65 LS, R65 & R45. 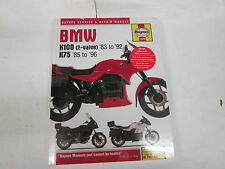 Haynes BMW R50,60,75,80,90,&100 Twins Manual 498cc To 980cc 1970 To 1983 Vgc In good clean condition a very handy manual. THIS SERVICE MANUAL COVERS 1970-1983 BMW R100-R90-R80-R75-R65-R60-R50 TWIN MOTORCYCLE MODELS. INCLUDES COMPLETE SERVICE, REPAIR, AND MAINTENANCE INFORMATION FOR 1970-1983 BMW TWIN MOTORCYCLE MODELS. It is dated 1983. Contains 12 pages including the covers. UK K75 740cc 87 - 96. USA K75 740cc 88 - 95. BMW K100 and 75 2-valve Models (83 - 96). UK K100 987cc 83 - 90. USA K100 987cc 84 - 86. UK K75S 740cc 86 - 96. UK K75RT 740cc 91 - 96. - Quick and easy fault diagnosis sections. It covers the K100, K100RT and K100RS. This is a nicely illustrated 36 page (including fold-out pages) colour brochure. This Haynes BMW Service & Repair Manual is the wear-resistant hardback edition and covers the K75, K75C, K75S, K75T & K75RT models produced between 1983 & 1992 and the 2-Valve K100, K100RS, K100RS Special Edition, K100RT & K100LT models produced between 1985 & 1996. 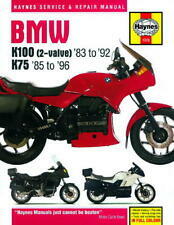 THIS SERVICE MANUAL COVERS 1983-1987 BMW K100LT, K100RT, K100RS, K75S, AND K75C MOTORCYCLE MODELS. 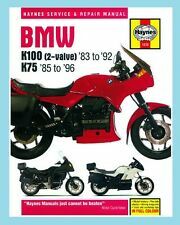 INCLUDES COMPLETE SERVICE, REPAIR, AND MAINTENANCE INFORMATION FOR 1983 to 1987 BMW K100 & K75 MOTORCYCLE MODELS. THIS OWNER'S MANUAL COVERS 1983 BMW R80RT, R100, R100CS, R100RS, AND R100RT MOTORCYCLE MODELS. Make 1983 BMW R80 & R100 MOTORCYCLE.